Starting in November our gift shop is all dolled up for the holidays. 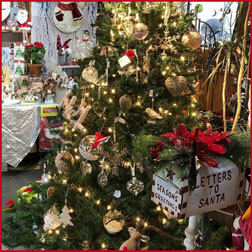 We have ornaments, gifts, and decorations for your home. We offer free gift wrapping, free hot cider, a no-stress shopping environment and the best service around! If the weather cooperates, you can take a walk in the garden too!